The Coopered Tot: Suntory becomes a caretaker of American Bourbon traditions. And that's OK.
Suntory becomes a caretaker of American Bourbon traditions. And that's OK.
High end Suntory whiskies glitter like the jewels they are. Yamazaki 25 is the second from left. You will never get another cent from me ..
Go count your yen and choke on it..."
"You sold heritage to a bunch of japanese businessmen. Sell outs! Sure, it might taste the same but it's not and ya know it. You just sold out a kentucky tradition to another country." " I don't own a Japanese car I will not drink a Japanese bourbon. I would drink saki if I wanted a Japanese drink"
"SELL OUT... Continue to brew your whiskey, I for one will not buy 'Japanese Whiskey'"
Do all of these people understand that Bourbon, by law, must be made in the USA and thus every single drop of Bourbon is American? Do they understand that Beam's management team, not to mention all the distillery jobs, aren't going anywhere? That no one is changing the mash bills or recipes or the flavors of the iconic Beam Bourbon brands? That other major Bourbon distilleries are already foreign owned? Who knows? It's an emotional "gut" sort of thing with some people. 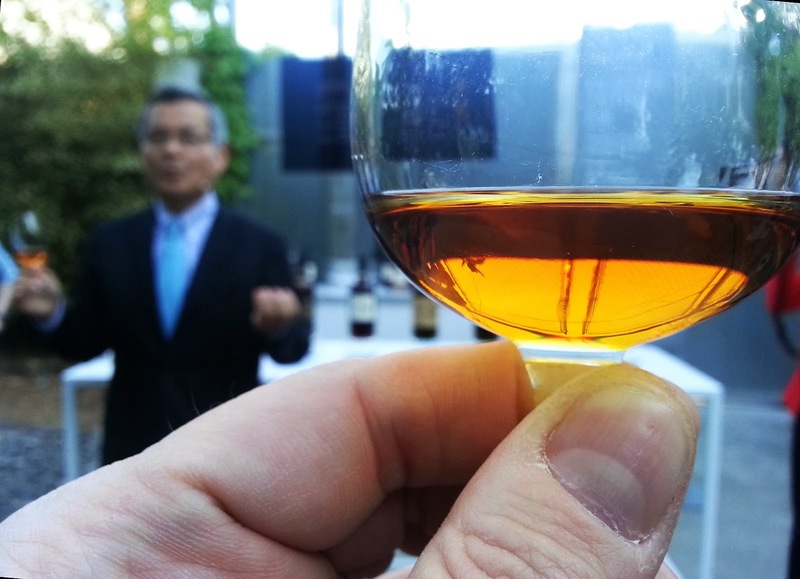 "The Japanese economy, which had grown at an outstanding rate in the 1960s and 1970s and continued to do so in the 1980s, also paved the way for bourbon’s comeback. Along with such best-selling brands as Early Times, Four Roses, Maker’s Mark , and Jim Beam, Blanton’s caught on in the Japanese market, selling for a very high price, and making Age International a nice profit. But the favorite was I. W. Harper. It sold so well that Schenley pulled it from the American market in order to circumvent its profits being funneled off by the gray market—"
"Just as Scotch whiskey went global by following the armed forces of Britain to every corner of its empire, so too bourbon whiskey followed the U.S. military to its bases in South Korea , Japan, Germany, and Italy. Initially available only through base exchanges, bourbon was soon among the standard offerings of local bars catering to servicemen, giving the locals a chance to develop a taste for it as well." Veach, Michael R. (2013-03-01). Kentucky Bourbon Whiskey: An American Heritage (Kindle Locations 1185-1188). The University Press of Kentucky. Kindle Edition. To return to the irony of the "patriotic reaction", there is also the fact that Japanese whisky companies are already deeply involved in the Bourbon business - from Kirin's ownership of Four Roses to Age International being owned by Takara Shuzo Ltd. (That's the company that flipped what became Buffalo Trace at the turn of the current century, but kept ownership of the Buffalo Trace Mashbill #2 brands like Rock Hill Farms). Japan's involvement with Bourbon is nothing new - but somehow, with Jim Beam and in the current cultural mania over Bourbon it's different this time. Or is it? Of course Beam International isn't just Jim Beam Bourbon, it's a multinational conglomerate with distilleries and products around the world - and that's true for Suntory as well. Suntory owns Morrison Bowmore and their moves there, such as making Rachel Barrie master blender and giving her tremendous freedom to be creative have resulted in some stunning whiskies and a some major turnarounds. As far as patriotism goes, generally speaking, major multinational corporations are multi-national. If you buy a Ford made in Mexico is it a more patriotic act than buying a Toyota made in Tennessee? The idea that "the dollars stay here" is simply out of touch with the reality of the global economy. The real issues are functional: will it serve the whisky? Will acquisition by a private company ultimately be beneficial to the brand from an enthusiast perspective? Will it be good for us like Kirin ownership of 4 Roses? 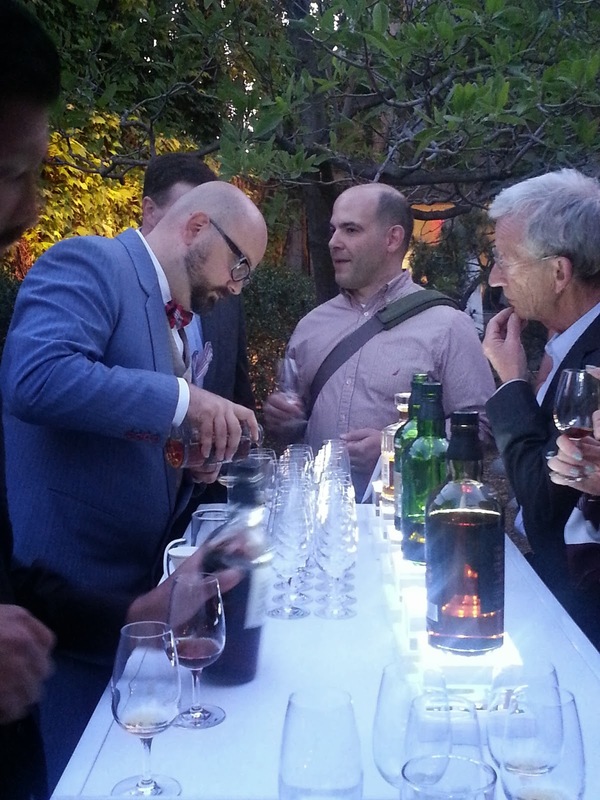 Or will it be more like Campari, literally watering down Wild Turkey?" I answered by equivocating - talking about how Suntory sticks to its guns and many of their expressions are just sold out a lot of the time and they aren't building new distilleries. But I also noted that they are lowering the proof of Hakushu Heavily Peated for imports to the US (starting this year) to 43% abv. from the 46% abv. it's sold at in Europe. But I had an experience in the Spring of this last year that really taught me something about Suntory. It's something that gives me comfort and should give you some too if you have concerns about this deal. What I saw was an obsession with quality and with the production of some of the worlds greatest whiskies. 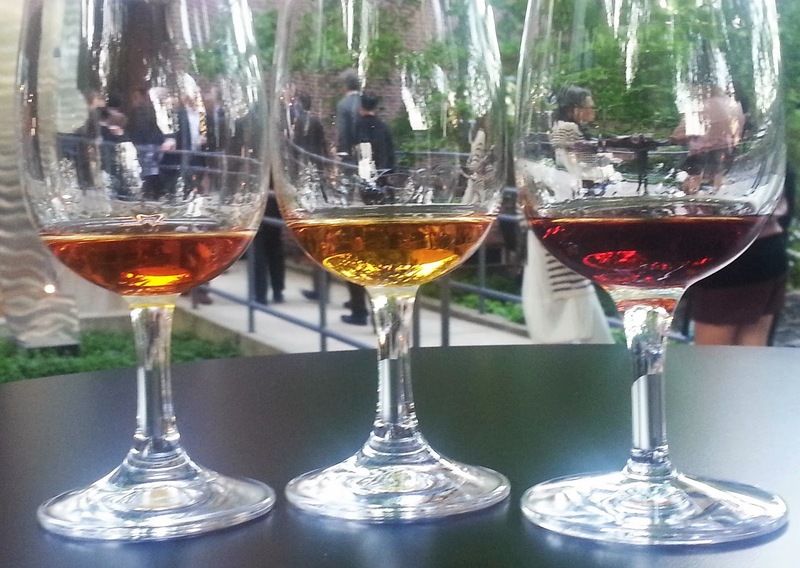 The experience was an event: Suntory's 90th Anniversary celebration. If you want to know about that astounding event, I'll refer you to the excellent work of several other whisky bloggers who were there and who all wrote up great posts about the event (links at bottom). I wasn't blogging at the time, so I didn't. There was something about that event that was really special. Not just because it was the most astoundingly slick and beautiful whisky event I have ever attended or even ever heard of (because that is about the event - and not the whisky) - but because the whisky they were pouring was extraordinary and really astounded me. I'm not here to write up the event 6 months too late. I'm here to tell the story of the whiskies they poured. You see, I took samples - and I did follow up tastings (actually with a number of people including Peter Silver and Steven Zeller - The Smoky Beast. And the whiskies that they served on the main bar (depicted in the photograph at the top of this post) rocked my world. 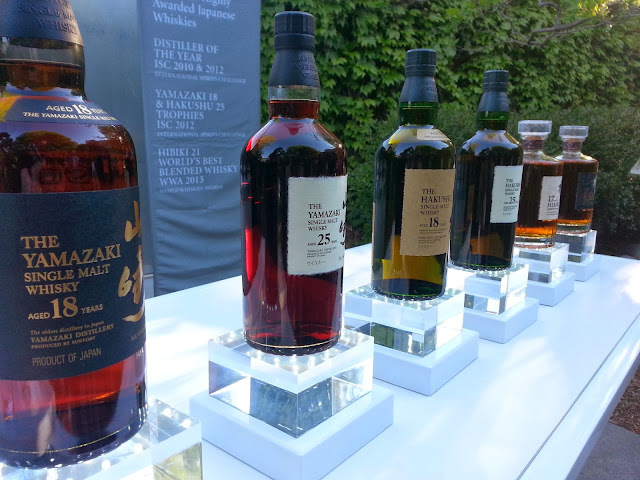 From left to right they were Yamazaki 18, Yamakai 25, Hakushu 18, Hakushu 25, Hibiki 17, and Hibiki 21. I'm going to brief (ha ha). Here are tasting notes for just a few of the highlights (Suntory's entire line of single malts was poured that night and I had them all - but will limit tasting notes to my top 3) and a a conclusion to wrap this all up. In the glass. Left to right: Hibiki 21, Hakushu 25, and Yamazaki 25. FYI - Hibiki is complex blend of Hakushu and Yamazaki malts and Chita grain (which is just wonderful - a butterscotch bomb). As a blend there are a wide variety of malt, grain and wood influences which include American oak, Spanish oak, Japanese oak, and Japanese plum wine cask. Palate opening is sweet and richly floral with plum blossom, and melon. The mid palate is rich with honey, malt, bananas and butterscotch (which I recognize from the Chita grain). The turn to the finish adds the complexities of mineral, forest, and a kiss of iodine and distant smoke. A delicious whisky that takes sweetness close to the line, but stays dry enough and complex enough to be an absolute stunner. pours for grateful people including, G-LO. Center. Nose: big waxy estery fruity florals. Orchids, magnolia, and ambergris. Underneath there are complicating notes of mineral, forest oak leaves, and iodine. There are distant notes of high grade leather and whiff of smoke. Palate: sweet, complexly floral in a tropical jasmine and magnolia vein, malty buttery, waxy and brilliant on the opening. It just gets better on the mid palate as tropical fruits (quince, mangosteen, gogi, pineapple, and apple) emerge and dance with the complexity of mineral dust, oak tannins and smoke. The turn to the finish is lovely as the elements turn toward oak and roasted seeds. The finish is long, fruity, malty, oaken, and still, somehow, floral to the very end. Complex, and richly intense, but what's special is how it melds light and dark aspects of the uniquely Japanese unsherried flavor profile. Color: an astonishing scarlet dark reddish amber with mauve, almost purple glints. I'm sorry to go on about the color but it is outstanding. Nose: really big and involving evolving progression of dried roses, raisins, plum and berry jam, old oak, red fruits, rosemary herbals, and sandalwood incense. The palate, even at 43%, luxuriates in a syrupy thick mouth feel with mouth filling flavors of rose floral and chocolate covered raspberry sweetness expanding into elegant rancio, toffee, sherry, dried fruits (fig loaf, black raisins) and pipe tobacco. The finish is extremely long with dried figgy fruits, pannatone, and old money fancy oak furniture. An incredible dram. Truly memorable. I wish I could even think about affording a bottle. Definitely one of my fantasies. Conclusion: Suntory is a company that is obsessed about quality whisky and has a deep and abiding love for whisky. Having tasted their top expressions (which have won pretty much every award in sight, by the way) has convinced me that something special is in the DNA of that company. A company that can make whiskies like this as OBs (Original Distillery Bottlings) is clearly deeply into the topic of what makes a whisky great. All in all, I'm sure Beam International is in fine hands. Here's to hoping that they consider bringing some of this magic to Beam's Bourbon line up. Fantastic post. I've been hoping to see more posts like this about the acquisition, but everyone from TIME to the Wall Street Journal are jumping on the fear band wagon in what seems to be a bid to "out patriotic" everyone else with what seems like no research or journalism. Not a single one of the big outlets that I've read has even mentioned that Jim Beam represents only about 9-10% of the products owned by Beam Inc. and the other 90% of their products (and the other 90% of the reason for the acquisition) are scattered across the globe and the spirits category. I also like that you mentioned the care that the Japanese take with whisky. They take it very serious and have since Mastaka Taketsuru came back from Scotland after studying whisky creation from the masters. Thanks again for such a great, level-headed post! Thanks so much for commenting, Josh. Everyone here should immediately read your blog post on this topic: http://thewhiskeyjug.com/whiskey/5-reasons-to-stay-calm-about-the-whole-suntory-buying-beam-thing/. You make a number of extremely good points. You also link to a shocking and uninformed article in Time where they suggest 5 alternatives to Jim Beam's for "patriotic Americans" including Buffalo Trace (that was owned by a Japanese company briefly - a company which still owns a number of the brands in the BT portfolio), Angel's Envy and Willets - both fine companies and both becoming active distilleries which will sell their own juice someday but which, for the moment, sell whiskies made elsewhere including the distillery in Indiana which was built by a Canadian owned company. So Time is just 2 for 5 - which underscores what a useless point that are making. Thanks for providing the link that that article. http://nation.time.com/2014/01/13/five-jim-beam-alternatives-for-the-patriotic-bourbon-drinker/. Extremely informative! I gasped when I first heard about the purchase, but it's great to read all these facts because I had not read them anywhere else. I like that you noted that Suntory is a company that is obsessed with quality and production, to me that means that Jim Beam is certainly in good hands. Thanks for sharing! Cheers! Great stuff Josh! Well done. I'm originally Dutch as you know and since Holland is such a small country we are used to think - and look beyond the borders. I can appreciate that's it's different when you live in a huge country like the USA. Still, today's world is a global one and we better get used to it. And Jim Beam will be in good hands with Suntory.Their quality approach can only add value to JB. Finally some common sense has been injected into this story, and as usual, it's from a blogger. THANK YOU! processes for existing products are not something they are interested in.